Wesfarmers Ltd – Little Shop, big sales – Ticker: WES.AX, Closing Price: 47.33 AUD, Target Price: 48.00 AUD, Recommendation: Hold. Sales were always going to be strong but seem to have normalised – Coles’ supermarket sales were always going to be strong given the benefits from 1) Little Shop; 2) free plastic bags; and 3) increased below the line Flybuys activity. LFL sales growth was 5.1% which was ahead of our estimate (DBe: 3.7%) but while not giving a trading update, the Coles CEO seemed to suggest the sales trend will moderate towards the levels seen at the end of 4Q18 (we est. c. 2.5% LFL). This is broadly in line with our channel checks which suggest that post Little Shop, Coles’ sales have slowed and Woolworths accelerated but the dynamic is not yet back to what it was in June. Suncorp Group – Here comes the SUN – Ticker: SUN.AX, Closing Price: 13.59 AUD, Target Price: 15.10 AUD, Recommendation: Buy. Pull back provides opportunity – The market correction has seen SUN significantly pull back from recent highs. The stock is now trading 15% below its pre-result high. The group has committed to returning $600m of capital to shareholders via the sale of its Life business, we also expect the ordinary dividend to be lifted on improving earnings, and in FY19 the cost out program starts to deliver significant benefits. A simplified operating structure, strong market positions and capital return make SUN an attractive investment at current levels. Viva Energy Group – Petroleum Statistics – August – Ticker: VEA.AX, Closing Price: 2.17 AUD, Target Price: 2.65 AUD, Recommendation: Buy. High fuel prices impacting on petrol demand but more than offset by diesel/jet – The Australian Department of the Environment and Energy has released its Australian Petroleum statistics for August 2018. The charts below outline the key data points of relevance to the refiner marketers, covering total petroleum product volumes, volumes of Petrol, Diesel and Jet fuel as well as penetration of premium petrol. As fuel prices have increased, petrol volume has come under pressure, with volumes declining by c. 5% for the past three months. However, overall volumes of Petroleum products remain robust with volumes growing by c. 5%, driven by Diesel and Jet fuel. Penetration of premium Petrol is down from its peak in Jan 16 which corresponded to the trough in petrol prices, but the decline has been fairly modest to date. Call to action – Morgans QLD Conference – Key picks Morgans was pleased to host its 28th Annual Queensland Conference featuring 45 companies across a broad cross-section of the economy. This year’s presenters were broadly upbeat, with corporates cautiously optimistic about their growth outlook, although management teams continue to strike a balance between controlling costs and investing for growth. Common themes included: cost control initiatives; enhancing digital offerings; corporates seeking offshore expansion; and leveraging strong energy markets. We discuss our key conference picks in more detail and summarise the presentations from all the companies. US Market: US stocks ended lower in a choppy trading session on Monday as technology stocks were pressured by lingering worries over interest rates and corporate earnings. 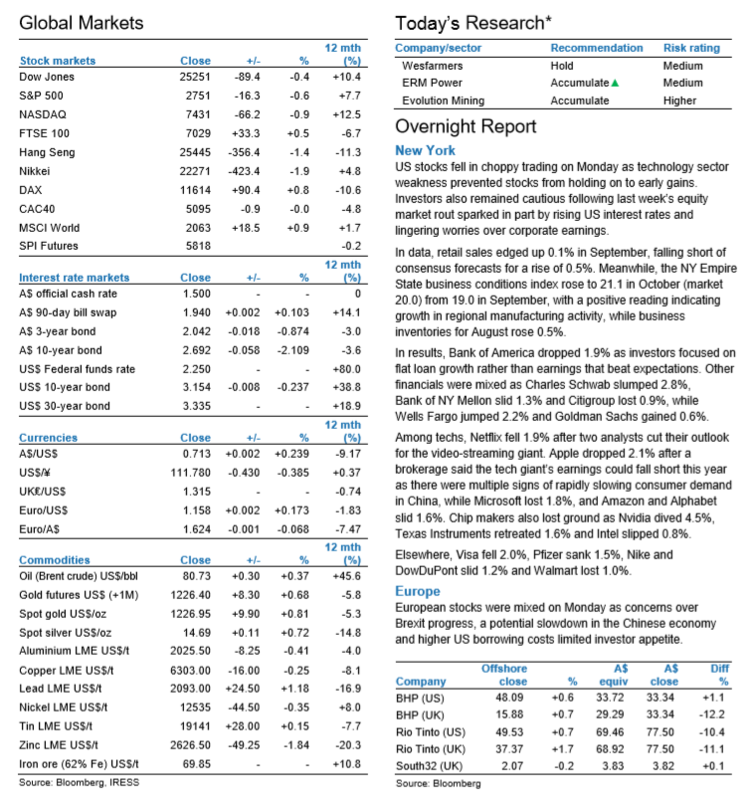 European Market: European stocks eked out slight gains, as investors weighed geopolitical tensions and looked ahead to U.S. earnings season, in the hopes that strong corporate results might provide the next positive leg for eurozone stocks. Asian Market: The Hong Kong stock market closed lower on Monday, weighed down by the falling mainland market and concerns over the US-China trade conflict continued to limit investors’ appetite. Wesfarmers Limited (A$47.18) HOLD TP A$48.40 Coles gets ready for demerger. Coles’ 1Q19 sales update was ahead of our expectations on the back of the highly successful ‘Coles Little Shop’ campaign, improved in-store execution and investments in flybuys promotions. The strong sales result however was offset by a number of additional costs. We reduce Coles’ FY19F EBIT by 1% to A$1,9m. Our forecasts for WES’s other divisions remain unchanged. We maintain a Hold rating on a lower A$.40 target price (from A$51.43). ERM Power Limited (A$1.62) ADD TP A$2.05 Exit from the USA. EPW has netted 13 cps from the sale of its loss-making USA business. This is the key driver of the increase in our target price to $2.05ps (~27% upside at present). Estimated dividend yield at current prices is ~8.6%, assuming dividends double as the cashflow used to support the USA losses is instead distributed to investors. The 1H19 result is likely to be a key event as clarity is provided on FY19 gross margins and the capital management framework postUS exit. Orica Limited (A$16.40) HOLD TP A$17.25 FY18 result preview. ORI reports its FY18 result on Friday 2 November. A weak result has been well guided to, although 2H18 trends should show a material improvement on the 1H18. We have made slight revisions to our forecasts for delays with Burrup’s ramp-up, tough operating conditions in Latin America and the turnaround at Minova is taking longer than expected. While FY18 should be as bad as it gets for ORI, we think its share price is reflecting a recovery given the company is trading on fair multiples in FY19 and FY20. We maintain a Hold rating with a new price target of A$17.25. IRESS Limited (A$11.24) ADD TP A$14.52. Recommendation upgrade Following a recent share price fall we upgrade our IRESS recommendation to BUY (was HOLD). While we expect the IRESS share price to remain volatile in the near term, driven by financial markets, we feel that the risk-reward trade-off is now more attractive. There are no changes to our forecasts, valuation or price target. Cooper Energy Ltd (A$0.46) ADD TP A$0.61. Eye on future growth Focus returning to growth, with COE outlining a clear focus on exploring two offshore prospects in the Otway and appraising deeper targets at Manta. Overall a steady 1Q19 result, with lower pcp production more than offset by the strong price environment. 1Q19 saw production -14% pcp with: 1) lower Casino-5 output (albeit recovering post April 2018 workover) and 2) on field decline in the Cooper Basin. Despite decreased volume, 1Q19 sales revenue jumped 7% to A$21.8m (from A$20.4m) with AUD oil price up 11% to A$113.65/bbl. We maintain our Add rating on COE with an A$0.61ps price target. Otto Energy Limited (A$0.06) ADD TP A$0.10. Eight more targets to come Not an ideal start to OEL’s exploration program, with BYE-operated Bivouac Peak and Hilcorp-operated Big Tex both proving non-commercial. We view the resulting share price sell off as leaving little value priced in for the remaining eight exploration targets, highlighting an opportunity. P&A of Bivouac Peak is cheaper than we expected, while lower capex on both prospects will have a positive impact on FY19 cash flow. Removing Bivouac Peak & Big Tex has reduced our valuation to A$0.101ps. We maintain our Add rating on OEL, with a A$0.101ps price target (was A$0.12). Praemium Limited (A$0.90) ADD TP A$1.07. Tracking to schedule Praemium ended the September quarter with funds on platform of A$5.58bn, up 29% yoy. While net inflows were a bit weaker than expected the company remains confident that inflows will improve in the next few quarters due to new customer signings. The company remains on track to meet our FY19 revenue and earnings forecasts. Our forecasts and price target of A$1.07 per share are unchanged. Our ADD recommendation is maintained. Technically Speaking – WBC, CBA, ANZ, NAB, MQG. Westpac Banking Corp (WBC) – Short term bounce. Commonwealth Bank (CBA) – Short term bounce. ANZ Banking Group (ANZ) – Short term bounce. National Australia Bank (NAB) – Short term bounce. Macquarie Group (MQG) – Short term bounce.